for the diabetes research of Denise Faustman, MD, PhD. Families whose loved ones have type 1 diabetes are stepping up to support Mass General researcher Denise Faustman, MD, PhD, who has found a potential breakthrough, now being tested in a clinical trial. Karen Noble of Rancho Santa Fe, California, likens her family’s 15 years of fundraising for Massachusetts General Hospital to the movie “Lorenzo’s Oil,” in which two parents embark upon a quest to find a cure for their child’s disease. 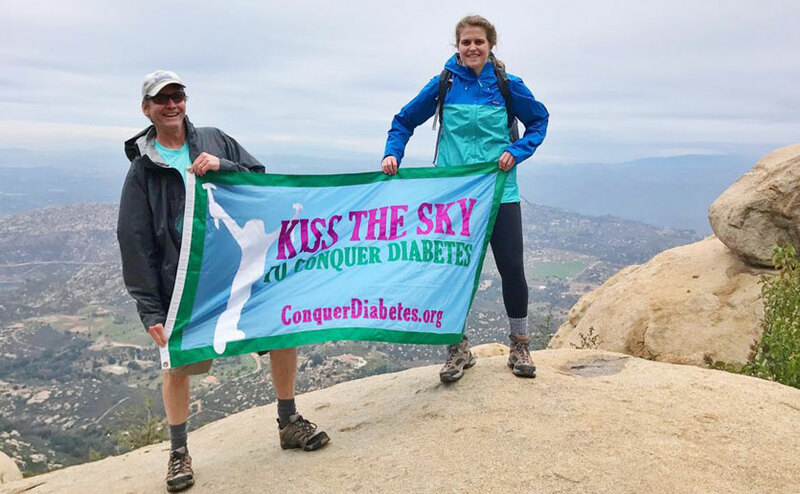 The Noble family says they will keep raising funds to support the research of Denise Faustman, MD, PhD, until it results in a cure for type 1 diabetes, which their daughter Kate, now 27, has had since age 1. Denise Faustman, MD, PhD, (left) with Kate Noble, who has had type 1 diabetes since age 1. Dr. Faustman is hot on the trail of an inexpensive vaccine that preliminary evidence shows could cause a permanent immune effect — even in longstanding type 1 diabetic patients. It could be a breakthrough towards disease reversal. Type 1 diabetes is a lifelong autoimmune disease, meaning that a person’s own immune system attacks cells in the pancreas that make insulin. Without insulin to help blood glucose (a type of sugar) get into cells where it’s needed for energy, glucose builds up in the bloodstream. Unless tightly controlled, excess glucose over time can damage eyes, kidneys and other organs and shorten lives. “We’ll keep supporting Dr. Faustman until a cure is found,” Rick Noble says. Since then, Rick has climbed not only Mt. Whitney, but also more than a dozen other summits in the United States and one in Bolivia to raise funds for Dr. Faustman’s research. “We’ll keep supporting her until a cure is found,” he says. Mass General has an active community fundraising program to support people like the Nobles inspired to take action and organize events, social gatherings and online campaigns to benefit the hospital’s world-class patient care and research. Called BeCause: The Mass General Fundraising Community, the program offers a website and online fundraising ideas and tools. Ten years ago, Dr. Faustman and her Mass General colleagues discovered that bacteria used in a vaccine to prevent tuberculosis could also potentially stop the abnormal immune response in those with type 1 diabetes. Called bacillus Calmette-Guerin (BCG), the vaccine was tested first in mice with advanced diabetes, which were essentially cured. She is now leading the second human phase of a BCG Human Clinical Trials Program. Results of the first phase, published in 2012, established that BCG is safe and could cause beneficial changes in the immune system towards restoring immune tolerance, even in those who have had the disease an average of 15 years. The second phase human trial will establish how many BCG injections it will take to get a more lasting disease reversal. This trial has four more years to go. In the meantime, last year Dr. Faustman reported on how the BCG vaccine, composed of an organism found in dirt everywhere, might have a permanent effect on the genes that control autoimmunity. Globally, other researchers are also getting positive clinical trial results with BCG, for example, using it for other autoimmune diseases like multiple sclerosis and food allergies. Early on, Dr. Faustman realized that this generic vaccine would not be profitable for companies, which typically finance clinical trials. She decided instead on a “for the people, by the people” fundraising approach. Grass roots efforts like the Nobles’, along with major support from the Iacocca Foundation, funded the first trial and, so far, all but $3 million of the $25.2 million necessary for the Phase II trial. Her annual family Dance Party fundraiser in Needham, Massachusetts, will this year support Dr. Faustman’s research. To support the research of Dr. Faustman, please contact us. Start a campaign today to create awareness and raise funds to support the Faustman Lab.